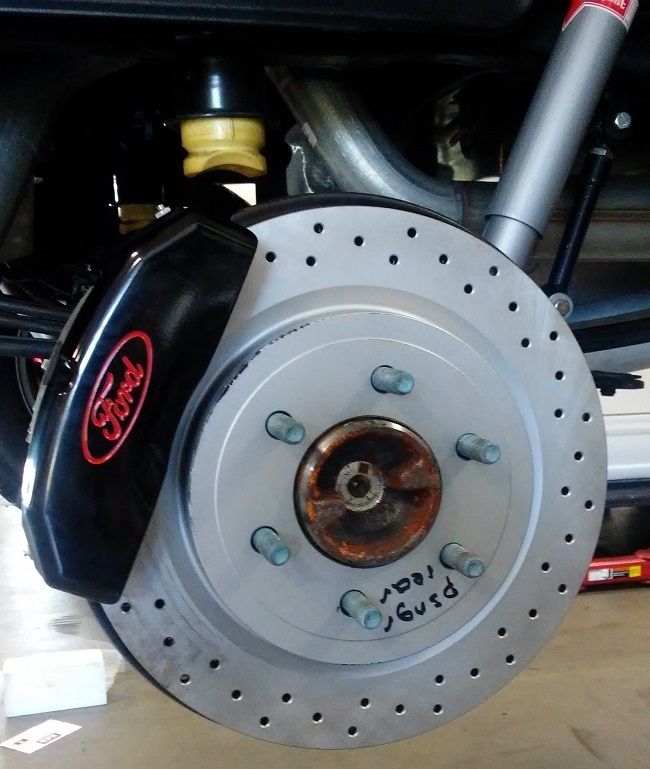 After about 35k on a set of EBC pads and EBC dimpled/slotted rotors, the pads are wore out and the rotors are worn down and also need to be replaced. The rotors really make me mad. Any suggestions on what to try next? I tow, so I need good stopping power. 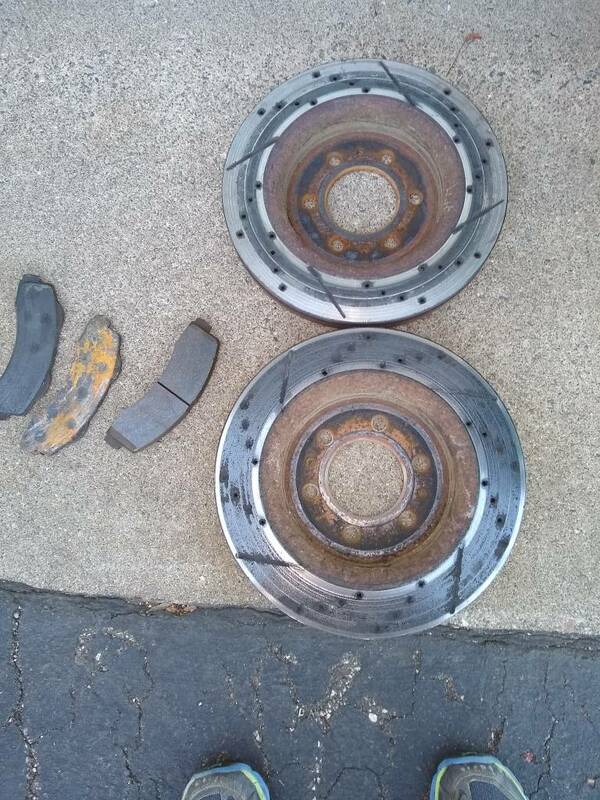 35K miles on a set of pads isn't all that bad, but how are the rotors worn down? I should have taken pictures of my powerstop z36's that I had to change on Monday. Driving to work and heard a loud grinding when stopping. When I got home, I took off the tire. Outside pads on both sides looked great. Inside pad on driver's side had wore into the rotor. Got Napa's best pads and rotors. Changed out the driver's side. Caliper seemed normal. Took apart the passenger side and I maybe had 100 miles left on the inside pad. Outside looked great. Both calipers compressed as normal. 30,000 miles on the original pads/rotors and 30,000 on the z36's. Now I'm trying to figure out if it's the calipers or brake lines. Truck seems to stop fine and I don't see any evidence of binding. The father in laws has a 2014 he rarely drives his truck and had an issue with his inside pads wearing also. Last edited by Lizardking419; 01-09-2019 at 11:15 AM. I'll say it up front that I don't know a lot about braking systems on these trucks, but the uneven pad wear between the "outside" and "inside" pads makes me wonder. The calipers are 4-piston, yes, in that there are pistons pushing on pads on BOTH sides of the rotor? This is kinda like the difference between a center-pull and side-pull brake setup on a bicycle. I could see uneven pad wear from a 2-piston caliper, but not from a 4-piston caliper, unless something's wrong with the pistons on the side that has more wear? Robert / SE VA & NC / 2018 F150 Supercab XLT FX4 2.7 ruby red / VTA mod; FlowMaster FX rear muffler; black dual tip; Husky rear fender liners; Unleashed 93 octane tune; replaced "FX4" bed decals with Molon Labe helmet; black F150 tailgate inserts; Hellwig rear sway bar; black hood panel; cross-drilled rotors; rear KYB shocks; REV9 FMIC; 18x8 Navigator wheels, 285/65 Mastercraft AXTs, STX grill swap w/LEDs. milesej05, Lizardking419 and noodles like this. Look up the grade of the iron used on the rotors. Yours are probably g3000. Look at my thread for e little more info. My rotors are g3500. Does anyone have ideas on why one brake pad gets worn more than the other? Bad caliper, bad brake lines, etc...? My slides were still lubed and moved fine. Mine is a 2013 with only 60,000 miles. Here are some pictures. I'm no auto mechanic but brakes are straight forward. Pads were correctly installed. 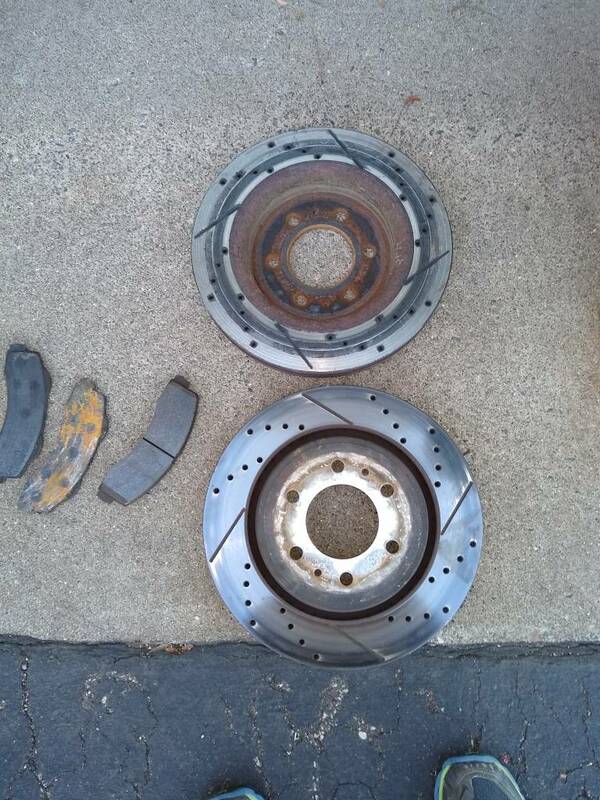 You can see the two pads on the left were the inner pads and the front of both rotors looked great. With respect to single piston or dual piston same side calipers. In almost every case if you are wearing an inboard or outboard pad significantly more than it’s mate pad, it is because the caliper itself is hanging up (piston in the bore) or the caliper is not sliding effectively on the mounts. It has zero to do with the brake lines. The dark blue color on the rotor is showing excessive heat. Obviously that it is the case once the pad is gone but if the pad is hanging up you’ll get blue stripes on the rotors or marks on the rotors before the pad is actually gone. Sadly, we can’t always see what the piston bore looks like until we tear them apart. That said, you can easily inspect the caliper mounts and mounting pins/bolts. If there is corrosion on the pins or mount it will hang up in short order. These can often times be cleaned up but new bolts/slides/mounts is usually a better long term choice. The new pins will often come plated or zinc coated and will last longer than on old pin. When it comes to corrosion inside the caliper it’s almost impossible to stop it over the life of the caliper. Frequent brake fluid changes will help but at the end of the day brake fluid attracts moisture in the air just like a magnet attracts iron. The brake fluid and water seperate inside the caliper and where the water ends up, it will leave a corrosion line that causes the piston to bind and not retract. This can be quite easily repaired during a caliper rebuild but rebuilt calipers are so cheap these days (respectively speaking) most people don’t bother rebuilding them but simply install rebuilt calipers. Calipers seem to have a mistique to many people kind of like transmissions (no a caliper isn’t in the transmission difficulty league) and seem to scare them. This shouldn’t be the case with calipers, they’re a very simple piece. Of course the more pistons you have the more complicated they become but single and dual piston calipers are not difficult to work with and rebuild kits are dirt cheap. If you have compressed air available calipers are a breeze to rebuild. There will be no doubt someone will say that compressed air can be dangerous when removing or seating a piston. I believe this is nonsense with a little bit of care, C-clamps, blocks of wood and rags this is completely safe. Once you’ve done it a couple of times it’s a 20 minute job for a caliper like is on our F150’s. As has already been said, there are rotors and then there are rotors. The higher number the better the rotor. 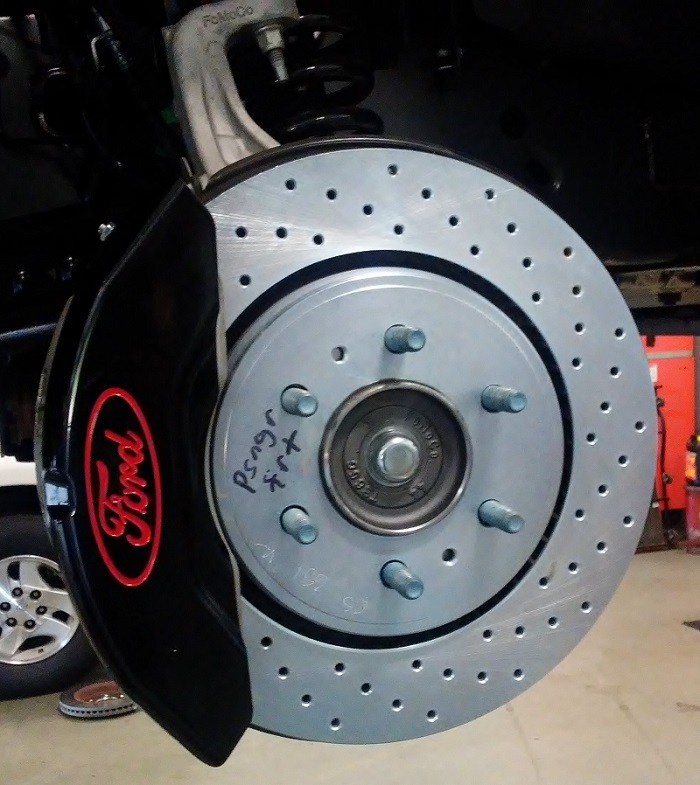 No rotor can survive a set of pads that have gone metal on metal. Lizardking419, noodles and N4HHE like this.